Bumblebee is back, but this time he's got a story of his own. Are you ready? Of course, you are! You are a Transformers super fan, after all, you probably grew up with the animated series as a child, and when the first Transformers came out in 2007, you were probably blown away by the CGI action. Well, now there's plenty of sequels to watch, and we've got a prequel, too, with the 2018 Bumblebee movie. So, it's safe to say you've got enough content to sate your fandom! But when it comes to adventure, maybe you've never even thought about suiting up as one of the amazing Autobots. Well, now's the time! Because we can get you into this slick Adult Bumblebee Muscle Costume. With tons of detail, this costume is going to have you playing the part of one of the most iconic Autobots! 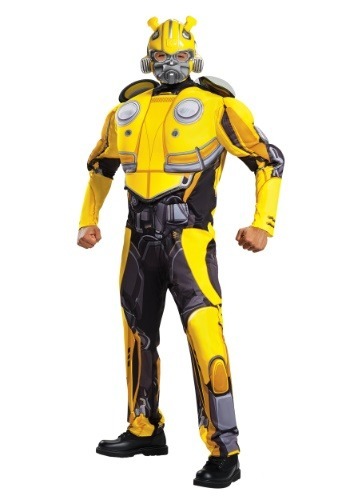 This Bumblebee Movie Adult Bumblebee Muscle Costume is officially licensed from the Bumblebee movie. The jumpsuit has serious details, including enhanced muscle and vehicle details. The polyester jumpsuit is fully printed and has polyfoam attachments and fiberfill stuffing for extra effect. The mask completes your robotic appearance, and will have you ready for a little real-life movie action! We're all about bringing the CGI action from our favorite movies to life. And, of course, we've got a huge selection of costumes to do it. Our catalog has all of your favorite characters, and we have them available in the sizes to get all your friends and family involved, too. Whether it's saving the world as the Transformers, or any other of your other favorite superheroes, we're sure you'll be saving the day with one of our costumes!